Permits are not needed to kayak or raft the Kaweah River. Make sure to check flows before you go because the water levels fluctuate constantly. Although many people envision a river trip that includes camping under a starry sky and sitting by a campfire, overnight trips are not really an option since most of the riverside land is privately owned. The Kaweah River is easily rafted in a day and there are numerous options for camping or hotels nearby. 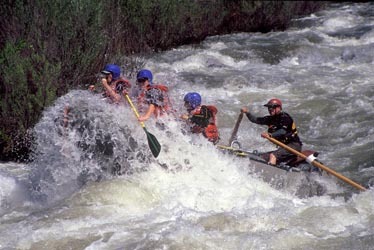 If you want to spend a couple days rafting, running the Kaweah twice makes for a great weekend. Since flows fluctuate depending on how much snow is melting, you can end up with an entirely different ride from day-to-day. Because land along the Kaweah River is privately owned, many boaters, and just about all commercial outfitters, stop at the riverside restaurants along the way to grab a bite to eat. Dave at the Hideaway runs shuttles for commercial outfitters, so if there aren’t many rafting trips that day, you may be able to hire him for a shuttle. Other than that, the drive from Terminus Reservoir to the Gateway restaurant is just a few miles on Highway 198. Parking is scarce at put-in, so many people opt for a bike shuttle. From Bakersfield take highway 198 east (toward Visalia) about 35 miles until you reach the town of Three Rivers. At the bridge on Highway 198 over the confluence with the East Fork Kaweah. It’s across from the Gateway Restaurant. From Three Rivers, head east toward Sequoia National Park on Highway 198. An alternate put-in is at Dineley Drive Bridge, a few miles downstream, however private boaters have run into trouble with land owners, so if you decide to put in at Dineley, make sure to stay clear of the “no trespassing” signs. Terminus Reservoir boat ramp on Highway 198. From Three Rivers, drive west on 198. The boat ramp will be on the right. There is plenty of parking available. If the reservoir is low, there will be rapids all the way to take-out, if it’s high, you might have a longer, flatter paddle out.